Mjolnir Magazine is at once an arts journal, an intellectual journal, and a turning point. Intellectually, Mjolnir ought be placed in a class all of its own—virtually every page informs the new reader, or deepens appreciation for what the target audience already is well aware of. Important Eurocentric cultural names, mentions of art movements, of nationalist political activism, of Eurocentrist spiritual and racial matters all are threaded through the magazine like bead pearls—each to be examined, researched, or reflected upon singularly and as part of the whole intellectual fabric. It is as a turning point, though, that I think Mjolnir is most significant—we on the right, we traditionalists, we who embrace the spirit of Europa, we who mourn the loss of our bright world and who fight as we must to keep the light of our race still tracing a path ahead—we have not had many art or intellectual journals dedicated to our aesthetic spirit for a very long time. The left is rife with them, if we consider their journals ‘artistic and intellectual’ (they do), but we . . . we who comprise what is the most European of arts and intellect, we have had to catch as catch can, publishing here, talking there, in venues and media, which are worthwhile and sound but not particularly dedicated to art or to catching the subtle aesthetic intellectualism that stirs and inspires the soul and the heart of the children of Europe. 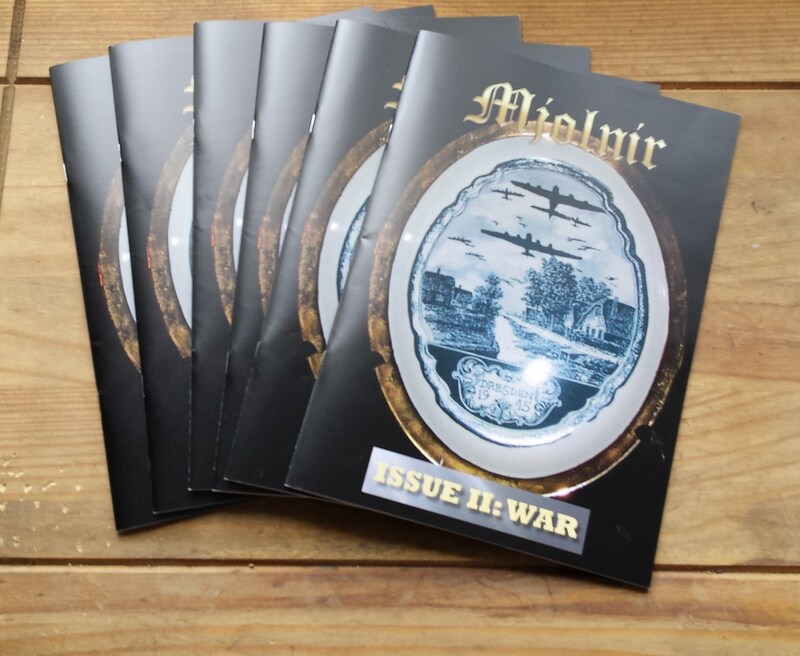 “Mjolnir is a magazine set up to collate and showcase these forms of illiberal Eurocentric arts” and it is thus a giant turning point, a marker, a sign that we, as a dismissed and reviled movement of awakened and aware folk, have come through our rough and arduous birthing—fighting tremendous resistance all the way — and now will (with a nod to Mr. Whitman) celebrate ourselves and sing ourselves because we know that we shall never, never, never lose ourselves. Nothing can stop us. Nothing has. With art comes soul, with soul comes spirit, with spirit comes victory. “The Maxims” open Mjolnir Magazine. The fact that there are exactly nine of them standing “for the Nine Worlds, nine that is the perfect number, that is thrice three, nine that is the inverse of six, the number of the eternal Enemy of Man” immediately sets the mood for the esoteric range of Eurocentric artistic, spiritual and cultural pieces that comprise the magazine. “True Art is that which shall reinvigorate the Racial Spirit. It shall be Masculine, Feminine, spiritual, virile, elitist and aesthetic” (Maxim III). A side bar to this editorial plugs the London Forum “a think tank for the radical right presided over by Jez Turner,” weaving in important names for the benefit of newly minted or potential Traditionalist artists and intellectuals “including the late Jonathan Bowden, Adrian Davies, Lady Michele Renouf, Richard Edmonds, Tomislav Sunić, Professor Kevin MacDonald, Greg Johnson, and Mark Weber . . .” The list of names of those who have spoken there makes me wish I was in London to attend future meetings, (for those who can attend, the side bar also lists the Forum’s contact information, which is very nice to have). In the grand tradition of literary and art journals, there are two complete short stories in this issue. One written by no other than Dave Yorkshire (Issue 1 also contained a story by him) and one by K. Bartholomew. Unlike most literary and art journals these days, these two stories are not degenerate or pretentious—but neither are they conservative. Yorkshire’s “Vikings At The Edge of Time,” and Bartholomew’s “Compliance” are Eurocentrist takes on horror, one dealing with time travel and the other with zombies. The inclusion of regularly spaced, non-obtrusive illustrations keep the pages from being overwhelmed with text. I won’t spoil the plots, so instead I’ll remark on the good job Mjolnir does with biographical introductions at the head of every piece—these lead-ins add a bit of a face, as it were, to the text as the reader gets to know who the author is, and where the author is coming from (artistically and/ or politically). Learning who some-one is, and where you can find more of his or her writings, is invaluable, particularly so for our illiberal corner of the literary world. Is destroyed . . .
and you and I shall never meet. Michael Walker (editor of The Scorpion and author of the highly praised play “Hitler’s Temptation” ) brings a different poetic sensibility to Mjolnir with two short pieces (one a het-met piece, the other a curtailed sonnet). “A star is born’ speaks to society’s marginalization of the radical traditionalist life, at the same time it addresses someone who has sold out for mainstream stardom; the clunky meter and rhyme, as well as the choice of words, underline the awkwardness of the situation so many of us find ourselves embroiled in—to follow our sacred path or to just get ahead. It is an ongoing war, so to speak, within our ranks. Troubling strangely the passer-by . . .
–a vain maid, lingering, loth to go . . .
Mjolnir does a great job with including full color photographs of the works of the artists featured in each issue. Issue II includes 5 paintings by Austrian artist Gunter Schoberl. His work has been called Cosmic surrealism, combining as it does, the eternal timelessness of “now” with metaphysics, dreams and the universal spirit; the symbolism is derived from European consciousness/esoteric Christianity, with (I think) a touch of Aryan/Buddhist Tibetan spirituality. Schoberl’s fantastical work is largely situated in a world informed by familiar Western motifs of dark/light, hands of God, fallen spirits etc. His other world is the place all Europeans (and for the purpose of this issue, those who died in the wars) eventually travel to. His painting Heimkehr der Seelen (Homecoming of the Souls), for example, depicts four pale faces streaming up from the earth in a loose lotus-like pattern across the cosmic “valley of death” into the light of the beyond. While difficult to pigeon-hole and certainly not high classical—his mostly self-taught flat-faced style brings to mind an Austrian counter-culture “Grandma Moses” (whose work, although mundane, I have always admired). His piece Der Ursprung, which features four corners of eyes (Aryan/Buddhist artistry) surrounding a blazing circular field (the pupil/iris of an eye?) in which is centered a very small iron cross (which represents Lucifer . . . the bringer of light), graces the back cover. I understand Mjolnir shall be endeavoring to share more of his work in Issue 3. Glorious stuff! I’ve admired his work for years, and it is very nice to see so much of it reproduced in a magazine. As well, it is very interesting to gain some insight into his history, his thought processes, his inspirations, and his influences. I won’t ruin the value of this issue by giving away too much about these delightful pages and pages of Krafftian treasure—let me just say that these pages include an original poem—more of a modern day saga or romance, really—by Charles Wing Krafft, and over a dozen illustrations of his work—most in full color—including reproductions of hard to find NSK ephemera. Having had the honor of meeting Mr. Krafft, here in the states, I can tell you that he is as intelligent, as witty, as interesting, and as deeply thoughtful as the portrait and the art included in Mjolnir make him appear – what’s more, Charles Krafft is nice, really and truly nice. He deserves to be respected both for his thought provoking talent and for his truth provoking courage—and, like every other brave but “sidelined” (his term) artist before him (the poet Shelley comes to mind, he was hated in his day for the things he said) Charles Krafft will never ever fade away–as a matter of fact, all of this will probably end up making his stay in the world of immortal artists a very bright one. Like I said, buy yourself a copy of this issue before they are gone. And put in your order for #3. Published: July 6, 2015 | This entry was posted in North American New Right and tagged book reviews, Charles Krafft, David Yorkshire, Eddy Morrison, Gunter Schoberl, Juleigh Howard-Hobson, K. Bartholomew, metapolitics, Michael Walker, Mjolnir Magazine, North American New Right, originals, painting, poetry, T. E. Hulme. Both comments and trackbacks are currently closed. Krafft rules. A true genius.